There has been a Church to St Peter on this site in Edensor since medieval times, and when the Church was re-built by the 7th Duke of Devonshire in the 1800’s, many of the original features of the early church were incorporated into the new one, including the south porch, the early font, a number of pillars and arches, and the magnificent memorial in the Cavendish Chapel. The architect for the Church we have today was George Gilbert Scott, whose designs were approved in September 1864, just after he had also won the competition to design the Albert Memorial in London, and work began four months later. 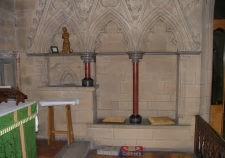 In addition to the external designs, Gilbert Scott was also provided designs for many of the interior fittings such as the new font, the pulpit, the altar table, communion rail, stalls, pews, and even the boot scraper outside the porch! 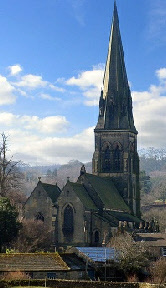 The building took 5 years to complete, at a cost of £14,000, and the new church as consecrated in 1870. 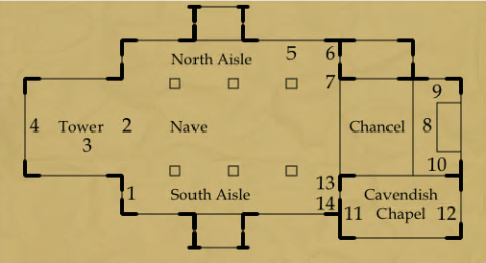 Click a number in the map below to learn more about that section of the church. Where sheep may safely graze, and keep the grass down! Please do not leave gates open around the grazed area of the churchyard. Searching for a member of your family tree? Try the monument search facility by clicking on the sheep image. in memory of Sir Joseph Paxton who died on 8th June 1865, and whose tomb is in the churchyard. The large font incorporates four marble columns of Duke's red marble to its base. 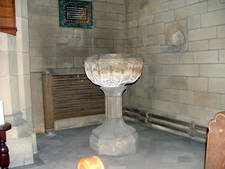 The new font cover was designed by Michael Brayshaw, and represents flames rising up, and water gushing in. It was made by Ray Bradshaw, and painted by Lawrence Udall in 1993. The Bell Tower (not accessible to visitors) holds a peal of six, all with the inscription J Taylor & Co, bell founder, Loughborough 1867. They were renovated and re-hung in 1981. 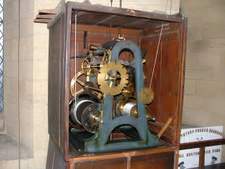 The Bell Tower is also home to the Church clock, made by Thomas Cooke of York and dated 1867. 4 Brass plaque in memory of John Cottingham. Brass plaque in memory of John Cottingham, steward to the 7th Duke of Devonshire for many years. 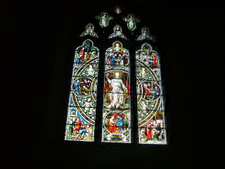 The beautiful west window above is also in his memory, and depicts the virtues of a good steward. It was designed by the Birmingham maker, John Hardman and was inserted in 1879. 5 World War I memorial. Memorial to those who fell in the first world war (1914 to 1918). Memorial to those who fell in the second world war (1939 to 1945). 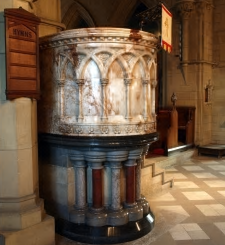 The main body of the pulpit is constructed of alabaster, and the remainder of locally derived marbles including bird's eye marble from Ashford in the Water, about 3 miles away. This is an unusual form of Ashford black marble containing small crinoid ossicles said to resemble a bird's eye. The columns are constructed from crinoidal limestone and Duke's red marble, which is a fine red limestone heavily stained by haematite. 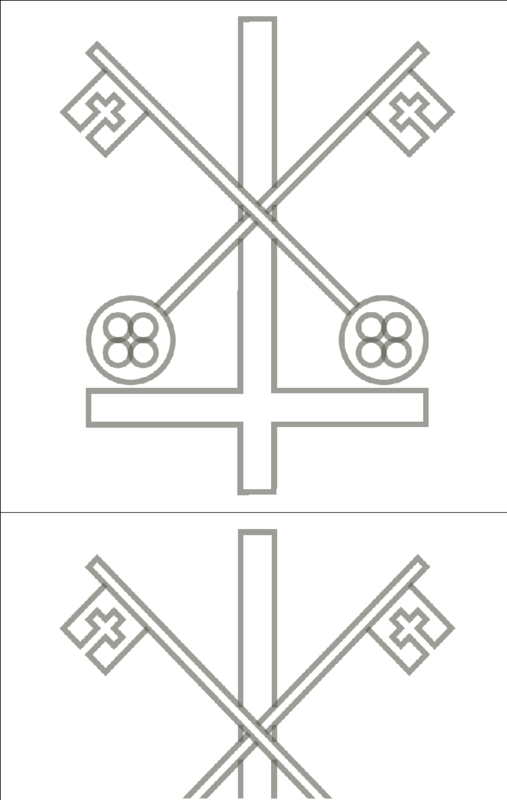 It also occurs in the sedilia and the font. 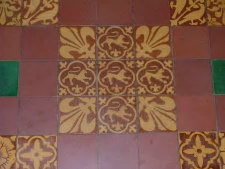 The Chancel floor is laid with a variety of encaustic, or decorative tiles depicting fleur-de-lys, roses, birds and lions. 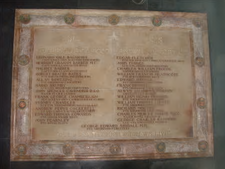 9 Wall plaque in memory of John Beton of Authmuthie. 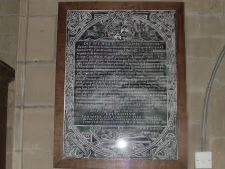 A wall plaque in memory of John Beton of Authmuthie , Fife, who died in 1570 aged 32. Beton was a man-servant to Mary Queen of Scots, who helped to rescue her from Loch Leven castle. The sedilia was used as a seat for the clergy during services. The piscine, where the chalice was washed after communion, is from the old church and was incorporated into the design. 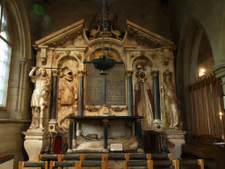 On the west wall, and originally behind the altar in the earlier church, is the memorial to Bess of Hardwick's sons Henry Cavendish(died 1616) and William Cavendish, 1st Earl of Devonshire (died 1625). 12 Monument to Charles Frederick Cavendish. 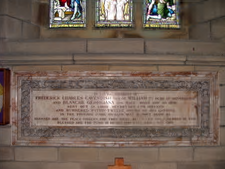 On the east wall is a monument to Charles Frederick Cavendish, son of the 7th Duke, and Chief Secretary for Ireland, who was murdered at Phoenix Park Dublin, within 12 hours of landing in Ireland on 6th May 1882 aged 45. To the left is a case containing the wreath of everlasting white and yellow chrysanthemums sent by Queen Victoria to the funeral in Edensor on 11th May, which was attended by more than a quarter of a million people. 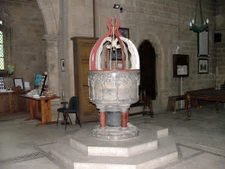 The old font appears to date from the early seventeenth century. An ancient piscina from the old church, incorporated into the new church. Its position here indicates that there used to be a side chapel in the old church. Within the south church porch are incorporated some stones from the original church, and on the left are three stone steps carrying a rather high sundial. These steps were the base of a Saxon preaching cross. 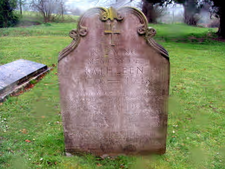 Within the Cavendish burial ground at the top of the churchyard, is the grave of Kathleen Kennedy. She married Billy Hartington, elder son of the 10th Duke in May 1944, and they had only 5 weeks together before he left with his regiment in the Coldstream Guards to take part in the Allied invasion of Europe. On 10th September 1944 he was killed in action and was buried in a military cemetery in Belgium. Four years later, his widow, Kathleen, died in a plane crash aged 28. The flat table of stone records the visit to her grave of her brother, John Fitzgerald Kennedy on 29th June 1963.